HP 643A (Q5950A) Black Original Toner Cartridge. 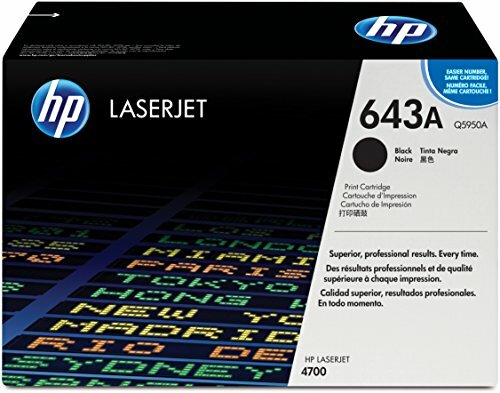 HP 643A toner cartridges work with: HP LaserJet 4700. Original HP toner cartridges produce an average of 71% more usable pages than non-HP cartridges. Cartridge yield (approx. ): 11,000 pages. Original HP toner cartridges are specially designed to work with your printer to consistently deliver standout results throughout the life of your cartridge. Ensure that your printing is right the first time and every time with HP printer toner: 643A toner. What's in the Box: New Original HP toner cartridge Color: Black. HP 643A toner cartridges work with: HP LaserJet 4700. 643A toner is designed to work with your HP printer for high quality, reliable results every print.